Are you looking for a mattress that feels luxurious? The Thatcher Super Pillow Top by 5 Star Mattress in Las Vegas might become your new favorite possession. Created with comfort in mind, this mattress combines the cushioning of advanced foams with the support of a durable innerspring system. Here are just a few of the features you will love about the Thatcher Super Pillow Top. To make the surface of your bed as soft and comfortable as possible, the Thatcher Super Pillow Top contains a thick layer of Gentle Support™ Foam. This foam is designed to gently cradle the body to reduce pressure points, while snapping back into place quickly to eliminate discomfort. Do you ever feel uncomfortably warm when you sleep? The Thatcher Super Pillow Top is also made with Gel Active® Foam that is infused with millions of microscopic gel beads. This innovative foam layer conforms to your body based on your body temperature while enhancing airflow, creating a cooling comfort you are sure to love. At the heart of the Thatcher Super Pillow Top is an impressive steel coil system that contains 711 individually wrapped coils. This innerspring system creates a stable, comfortable sleeping surface that resists motion and sound transfer. Being “Made in America” means that you won’t have to worry about what is inside your Five Star Mattress. Each Five Star Mattress is completely designed and created right here in the USA, protecting the economy and local jobs. Also, since the USA has stringent environmental regulations and emissions requirements, buying local products helps to protect our planet. With 23 factories throughout the United States, Five Star Mattresses take less energy to ship, decreasing fossil fuel consumption. To further protect customers, Five Star Mattress only uses foams that are CertiPUR-US Certified. This means that these foams are made without potentially dangerous or carcinogenic ingredients, such as phalates, formaldehyde, TCEP flame retardants, heavy metals, and ozone depleters. Also, CertiPUR-US Certified foams are made to emit fewer volatile organic compounds, protecting your indoor air quality. You can sleep a little easier at night knowing that your Five Star Mattress set is protected by their generous limited 10-Year warranty. In addition to protecting you against things like manufacturer’s defects, this complimentary policy also protects you from damage like sagging and body impressions that won’t go away. Best Mattress believes that getting an incredible night’s sleep should never be out of reach, which is one of the reasons they have decided to carry the Five Star Mattress brand. With a commitment to quality and keeping costs low, there is a Five Star Mattress made to fit any budget. Five Star Mattress believes in creating high-quality products that use the same technologies and materials as more expensive brands, but without the steep price tag. 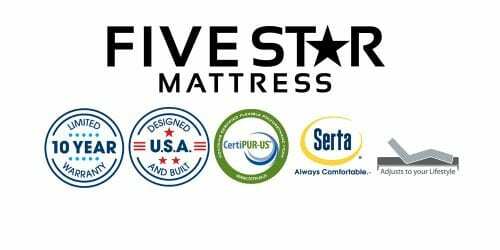 For more information about Five Star Mattress, visit a Best Mattress near you. In addition to offering a wide range of Five Star products, you can also explore incredible mattress accessories, including bedding, mattress protectors, and even adjustable bed frames.